So, who or what the hell is Venom? Well, he’s not from hell, but rather outer space, an alien symbiotic organism gathered on a space exploring mission from a roving comet. When the spaceship carrying the symbiotes (there are 4) crashlands on Earth, one gets away (via a host, since that’s what it needs to survive) while the other three are sent to the labs of the Life Foundation, which headed the mission, for further nefarious study. The company’s CEO, Carlton Drake (Riz Ahmed, Rogue One: A Star Wars Story) is looking to transform mankind to the next stage of evolution so it can conquer the stars and colonize other worlds, and he’s not above discarding any number of failed test subjects to achieve his goals. Enter star reporter, Eddie Brock (Tom Hardy, The Dark Knight Returns, Inception), who has a hunch that Drake is up to no good, and is willing to risk everything, even his relationship with his fiance, and lawyer working against Drake, Anne (Michelle Williams), to uncover the truth. Dora (Jenny Slate), a scientist at Life, comes to Brock with damning info on the goings-on at the research facility, and she helps him break in, where he soon encounters and becomes ‘partners’ with the symbiote known as Venom. At first, they are at odds, but eventually come to an understanding of sorts, and ultimately end up working together, after biting off a few heads, to fend off Drake, who will stop at nothing to get his creature back. 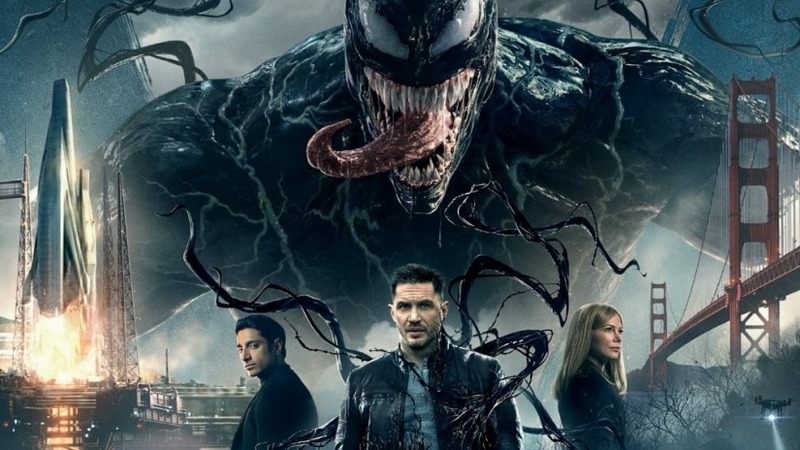 What could have been a tremendous misfire, Venom, instead, turns out to be a rather welcome triumph, working as both a comic book movie and an action-packed sci-fi/horror film. Much of the movie’s success has to be attributed to its lead in Hardy. His Brock is essentially a good guy, friendly to those that others scowl upon or look the other way, but at the same time, someone who is willing to risk the careers of others, including his own, to get at the truth of a story. 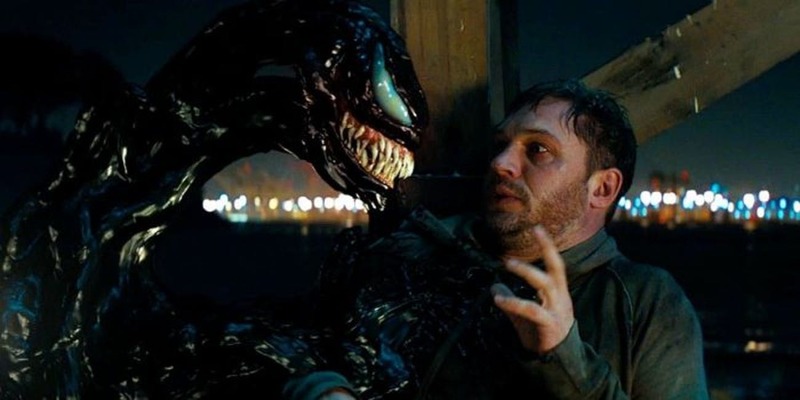 His battles, and eventual teaming up with the symbiote that inhabits his body, make for a remarkable performance, even moreso when you consider that Hardy is also doing the sinister voice of Venom as well, augmented by the fantastic audio f/x team. Having Brock fight against, and ultimately join forces with a creature that gives him fantastic powers and regenerative healing ability makes for a fascinating and compelling character that few could pull off effectively. And while this is a dark and dangerous character, there’s a humorous side to Brock tangling with his alter ego (Venom hates being called a parasite.) Ahmed also makes for a convincing villain, seemingly modeled after Elon Musk. While his goals at first – curing cancer, overcoming the problems of overpopulation and climate change – are lofty ones, power and greed inevitably get in the way and lead him astray. Michelle Williams, who’s been nominated for Oscars four times, adds intelligence, class and dignity to every film she’s in, and does so here as well, with her character not just the girlfriend/fiance/wife, but integral to the story as well. And Jenny Slate, who this Gore4er could never embrace in anything since her incredibly annoying character on NBC’s 30 Rock, has finally won me over with her smart, quirky, ambitious, altruistic scientist. Another aspect of the film that makes it all come together are the special effects. If they don’t work, and you don’t believe the transformations and the symbiote/human pairings, the film doesn’t work. Luckily they do, and the snarling, sharp-toothed, slime-slobbering symbiote is a wonderful sight to behold, with its tar-like tendrils emanating from Brock’s body tearing its ways through victims. At times, especially when Venom is somewhat separated from Brock, you can see the seeds that were planted almost three decades ago in James Cameron’s groundbreaking The Abyss and Terminator 2. And the ability to transfer from one host to another reminds one of films like The Hidden (1987) and Jason Goes to Hell: The Final Friday (1993). Since we are dealing with an alien creature that’s prone to chomping off and swallowing human heads, it’s a damn shame that Sony/Colombia opted to go with a tamer PG-13 rating rather than go full-on R like the recent Deadpools and Logan. Ah, what could’ve been. But the Venom character is part of the family-friendly Spideyverse, so if the studio is planning on integrating the characters in a future film, that may very well be the reason and you can’t entirely blame them. Well, you could, but perhaps an unrated edition might be on the horizon? One can only hope, but it’s doubtful that they ever even filmed any gory decapitation or other over-the-top violent scenes. A note of suggestion to studios’ marketing teams. 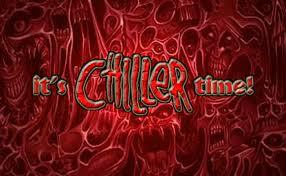 Please try and refrain from using scenes at the very end of the film in your promotional spots and trailers. It takes away somewhat from the movie as one waits the entire time to see how such previous briefly seen bits incorporate into the actual film. Plus, it’s just not cool. Speaking of the ends of films, as is usually the case, make sure you stay through ALL the credits. So, not just the mid-credits sequence that looks to set up the next film, but an extra special extended treat at the very end that features a certain web-slinging teen.